The BMW N55 is a turbocharged straight-six petrol engine that began production in 2009. The N55 replaced the BMW N54 engine and was introduced in the F07 5 Series Gran Turismo. The N55 was BMW's first straight-six engine to use a twin scroll-turbocharger. It also won three straight Ward's 10 Best Engines awards in 2011-2013. Following the introduction of the BMW B58 engine in 2015, the N55 began to be phased out. 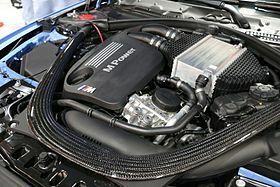 BMW S55 engine is a high performance version of the N55, which is used by the F80 M3, F82 M4 and F87 M2 Competition. The main differences between the N55 and its N54 predecessor are the use of a single turbocharger, the addition of Valvetronic and the type of fuel injectors. The N54 uses a twin-turbo arrangement, however the N55 uses a single twin scroll turbocharger. Valvetronic (variable valve lift) is claimed to improve throttle response, low-rev torque, exhaust emissions and to reduce fuel consumption by 15%. The direct injection system uses solenoid-type injectors, instead of the piezo-type fuel injectors used by its N54 predecessor. The piezo injectors were more expensive and BMW decided they were not worthwhile outside of Europe, because the potential benefits of lean-burn operation could not be fully realised. As per the N54, the compression ratio is 10.2:1, the bore is 84.0 mm (3.31 in), the stroke is 89.6 mm (3.53 in) and the displacement is 2,979 cc (181.8 cu in). Biturbo engine by Alpina based on the N55B30M0. The crankcase is of a different design and specially cast by BMW for Alpina. The N55R20A is Alpina's initial version of the N55, producing 301 kW (404 bhp). The S55 engine is the high performance version of the N55 engine. It was introduced in the F80 M3 and F82 M4, replacing the BMW S65 naturally aspirated V8 engine used in the previous generation M3. Differences compared with the N55 include a closed-deck engine block, lightweight crankshaft, strengthened pistons, different valve material, twin turbos, twin fuel pumps, active exhaust and revised intercoolers. This version produces 368 kW (493 bhp) and 600 N⋅m (443 lb⋅ft), due to the use of a water injection system. Three water injectors are used to lower the temperature of the air in the intake manifold, allowing the boost pressure to be increased from 17.2 psi (1.19 bar) to 21.6 psi (1.49 bar). ^ "The New BMW 5-Series Gran Turismo". Paultan.org. ^ "Ward's 10 Best Engines Winners, 1995-2012". Wardsauto.com. Retrieved 21 December 2017. ^ "BMW University Technical Training- B58 Engine" (PDF). Bimmerfile.com. ^ Ryan ZumMallen. 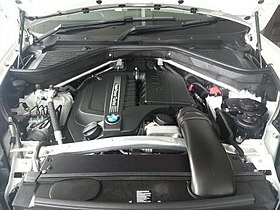 "Pop The Hood: Inside the Innovative N55 Engine in the BMW 335i". Automedia.com. ^ "BMW unveils single turbo N55 six-cylinder engine for new 5-series GT". Motorauthority.com. ^ a b c "BMW's Newest I-6 Better, Not Bigger". Wardsauto.com. ^ "BMW N54 and N55 Six Cylinder Turbocharged Engines". Unixnerd.demon.co.uk. Retrieved 20 December 2017. ^ "2011 BMW 335i Sedan". Caranddriver.com. ^ "The NEW ///M Motor in Depth". Bimmerfile.com. ^ "Turbocharging Technology (F30)" (PDF). Kneb.net. Archived from the original (PDF) on 2015-06-15. ^ "F30 powertrain" (PDF). bmwuniversity.com. Archived from the original (PDF) on 2014-06-03. ^ "Engine Electronics IPO's (F01-02)" (PDF). Kneb.net. Archived from the original (PDF) on 2014-06-03. ^ "Six-Cylinder 2012 BMW 640i Coupe Priced from $74,475, Convertible from $81,975". Blog.caranddriver.com. ^ "BMW 135is Coupe - Model Overview". Bmwusa.com. ^ "2012 BMW M135i". Autoblog.com. ^ "BMW's M135i is much better than it looks". Ausmotive.com. ^ Gratton, Ken (2016-12-23). "The Alpina philosophy - motoring.com.au". motoring.com.au. Retrieved 2016-12-24. ^ "Road Vehicle Descriptor (RVD1)". rvcs-prodweb.dot.gov.au. Retrieved 2016-11-24. ^ "F80 M3 / F82 M4 Complete Technical Docs (With S55 Engine Guide)". Bimmerpost.com. ^ "Meet The New S55 Engine". Bmwblog.com. ^ "BMW M2 Competition specs leaked". MotorMag.com.au. Retrieved 2018-04-10. ^ a b "2013 BMW M3 F80 specifications". Carfolio.com. Retrieved 21 July 2017. ^ "BMW M3 Sedan - BMW Australia". Bmw.com.au. Retrieved 30 May 2018. ^ "BMW M4 Coupé - BMW Australia". Bmw.com.au. Retrieved 30 May 2018. ^ "2015 BMW M4 GTS specifications". Carfolio.com. Retrieved 30 December 2017. ^ "First Drive Review - 2016 BMW M4 GTS". Caranddriver.com. Retrieved 30 December 2017. ^ "The 2016 BMW M4 GTS is a street-legal water-injected track monster, and it's coming to the US". Autoweek.com. Retrieved 30 December 2017. This page was last edited on 8 April 2019, at 14:07 (UTC).